This post has been viewed 752 times. Our dear forever friend Nona Brown passed into the arms of the Lord Saturday, January 6th at about 11AM. She rejoins her beloved husband Stan and son Scott in heaven. A viewing was held from 5 to 8 p.m. on Friday, January 12, 2018 at Codorus Church of the Brethren, 1129 Dunkard Valley Road, Dallastown. A celebration of Nona's life began at 1 p.m. on Saturday, January 13 at the Codorus Church, on what would have been her 83rd birthday. Interment will be private. She will be very, very missed by all who knew her and were lucky to have her in their lives. Good-bye dear friend - You will never be forgotten. Nona G. (Wright) Brown, 82, died Saturday, January 6, 2018 at York Hospital. She was the wife of the late Stanley E. Brown, with whom she shared 63 years of marriage. A viewing will be held from 5 to 8 p.m. on Friday, January 12, 2018 at Codorus Church of the Brethren, 1129 Dunkard Valley Road, Dallastown. A celebration of Nona's life will begin at 1 p.m. on Saturday, January 13 at the church, on what would have been her 83rd birthday. Interment will be private. Hartenstein Funeral & Cremation Care, Inc., New Freedom, is assisting the family. 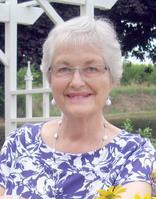 Born January 13, 1935 in Canton, Bradford County, Nona was the daughter of the late Wilbur and Mary (Mason) Wright. Her family moved to York County to operate Codorun Farms, near Indian Rock Dam, in her teen years and she went on to graduate from West York High School. Nona and Stan met while attending York Junior College and married on May 29, 1954 at Zion Evangelical and Reformed Church in York. Nona finished her teaching degree at Millersville State Teachers College, graduating in 1955. Following Stan's tenure in the Army, they moved to Loganville to assist with the family business. Nona taught elementary school for several years in Seven Valleys before assuming a full-time role working alongside her husband at Brown's Orchards. The impact of her contributions continue to be seen and felt today through the warm, welcoming atmosphere, beautiful signs and displays, and the children's educational programs at Brown's Farm Market. Nona was actively involved in the community. She was an organizational leader for the Loganville 4-H Club for many years, taught Sunday School at Zion U.C.C., and volunteered with Contact York. She also served on the Susan P. Byrnes Health Education Center Board of Directors from 2002-2005 and was an active member of Emanuel United Methodist Church in Loganville, where she shared her beautiful voice as a member of its music ministry. Nona and Stan were honored to receive the 2015 Susan P. Byrnes Health Education Center Founder's Celebration of Life Award and the 2016 Scott Brown Memorial Seeds of H.O.P.E. Award. Nona had a passion for teaching children about farming and healthy eating. She was deeply committed to serving others, and valued time spent with family and friends. She will be remembered most for her loving smile, beautiful handwriting, joy for music, and appreciation for the simple things in life. Nona is survived by her daughter-in-law, Brenda A. Brown, wife of the late Scott E. Brown, along with their children, Amanda S. Lighty and her husband, Jared A. Lighty and their daughter, Alyssa J. Lighty, and Travis S. Brown and his wife, Kayla M. Brown and their daughters, Hailey M. Brown and Grace C. Brown; her daughter, Linda C. Krupa and her husband, Nicholas E. Krupa, along with their children, Elena C. Krupa, Erin E. Bertke and her husband, Jordan T. Bertke, and Matthew R. Krupa; a son, David A. Brown and his wife, Mary I. Brown and their sons, Scott D. Brown and Sean A. Brown; her sister-in-law, Marjorie Wright; brothers-in-law, Richard H. Brown and his spouse, Lynn R. Spoor, and Roger L. Brown and his wife, Peggy A. Brown; and many nieces and nephews. She was preceded in death by siblings, Ella Lorene Hawthorne, Charles A. Wright, Frances Anderson and Robert M. "Bob" Wright. In lieu of flowers, memorial contributions in Nona's name may be made to Emanuel United Methodist Church, PO Box 484, Loganville, PA 17342 to benefit its music ministry or to the Byrnes Health Education Center, 515 S. George St., York, PA 17401 (byrneshec.org/giving).